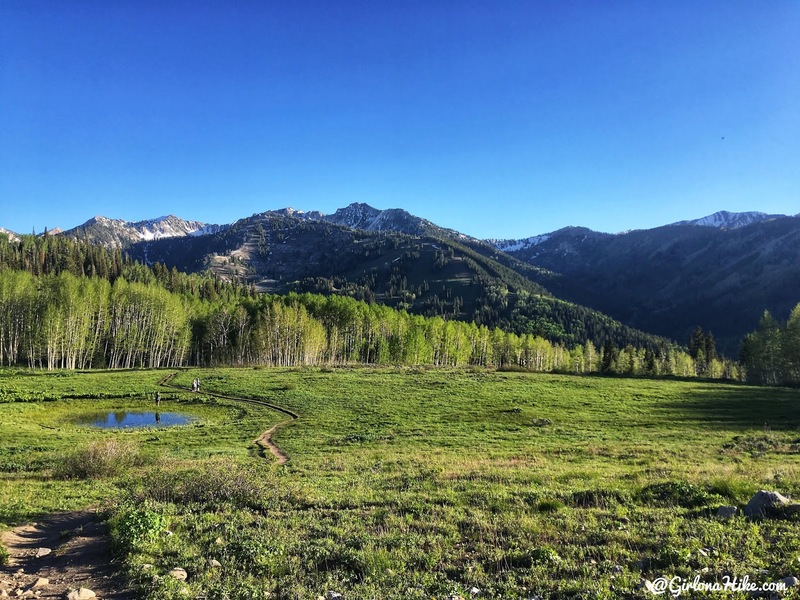 Willow Heights is nestled into the North side of Big Cottonwood Canyon, just below the Wasatch Crest Trail, and across from Solitude Ski Resort. 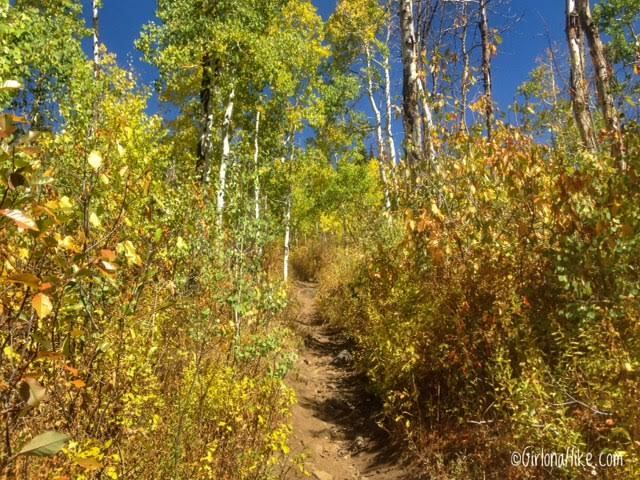 The Willow Heights Lake trail is fairly steep, but levels halfway once you are in a field of beautiful Aspen trees. Fast hikers should be able to reach the lake in under 30 minutes; slower hikers or hikers with small children can make it in around 1-1:30 hours (one way). Once at Willow Lake, you can actually hike around the entire lake, but that will add on an additional 1/2 mile. 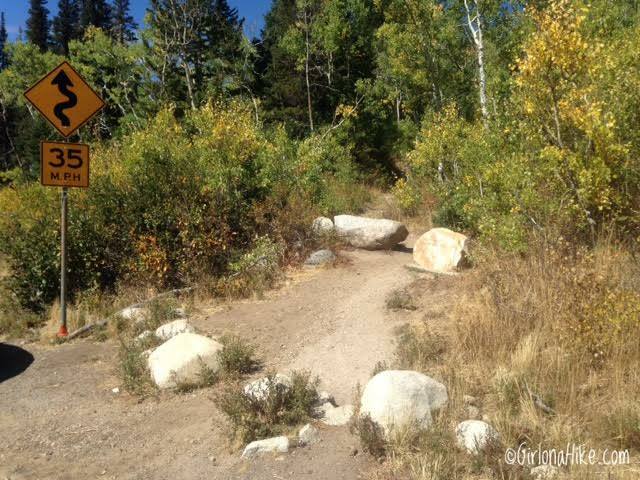 Dogs are not allowed on this trail nor in Big Cottonwood Canyon due to watershed rules. From SLC, head south on I-215 and take exit 6 for Wasatch Blvd. Turn left into BCC. Reset your odometer to 0. Drive 11.6 miles up the canyon road. The trail starts on your left (North), right by a 35 MPH signs, though you can't see the sign unless you are driving back down the canyon. 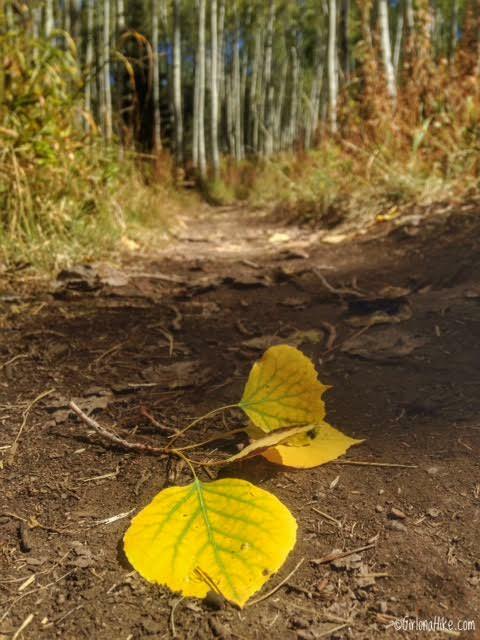 The trail is just past the Silver Fork Lodge. You will most likely see other cars at the TH, if starting after 10am on weekends. Here's a driving map. This is where the trail begins, right by the 35 MPH sign, on the north side of the road, and by these rocks. 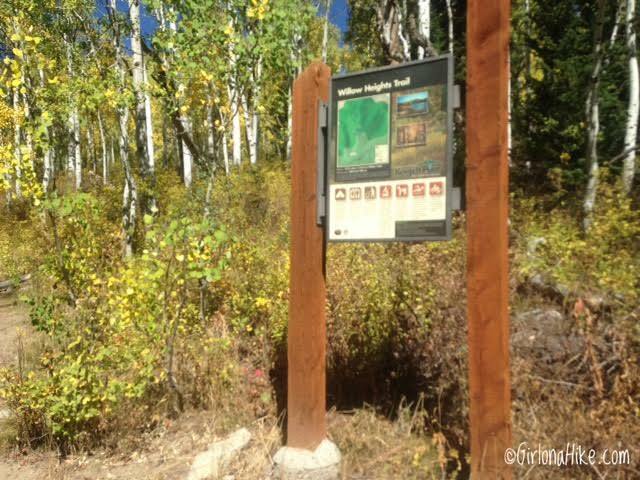 You won't see the official TH sign until a few feet up the trail. It says the trail is .75 miles one way, but on both my Gaia GPS and Google Earth map, I got .85 miles one way. Timing it just right for Fall. 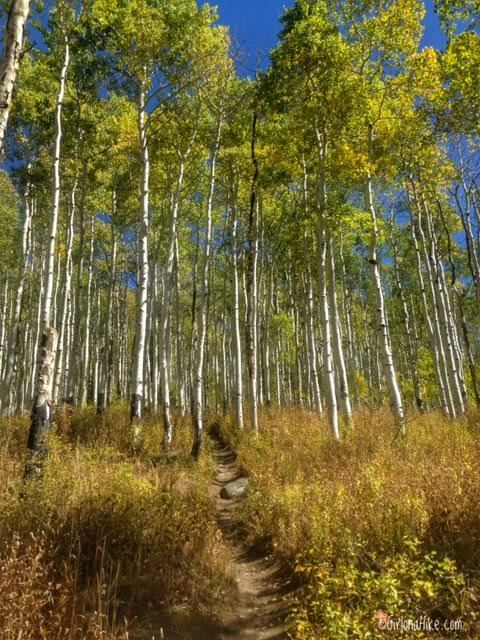 The beautiful Aspen grove trees. The trail begins to open up at 0.8 miles. You can walk around the entire lake, either direction. Yes the lake is pretty, but my favorite view is looking across to the BCC ridgeline and over to Solitude. So pretty! This is taken from the same spot as above but in early Summer of 2014. This is another great time to go, when everything is super green and lush. 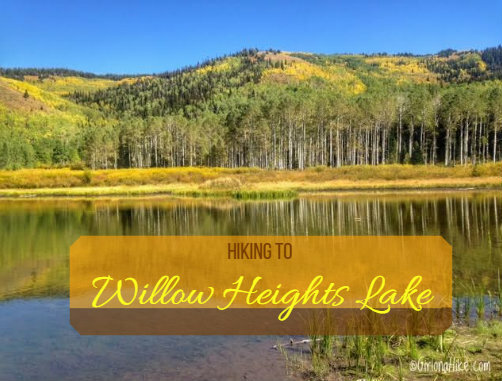 Trail map to Willow Heights Lakes. 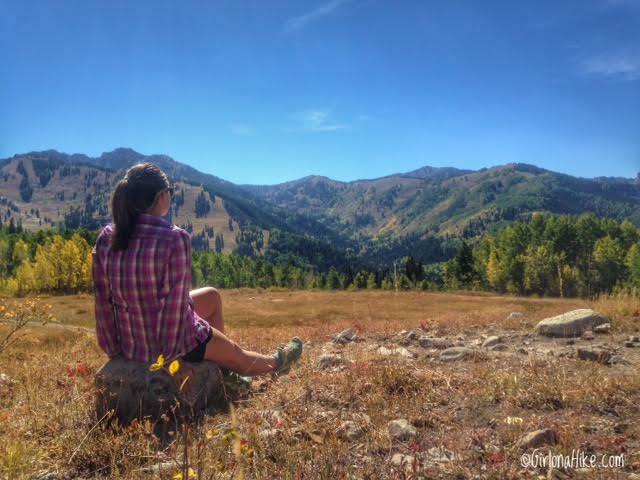 I admired how great of an "intro to backpacking" area this would be! 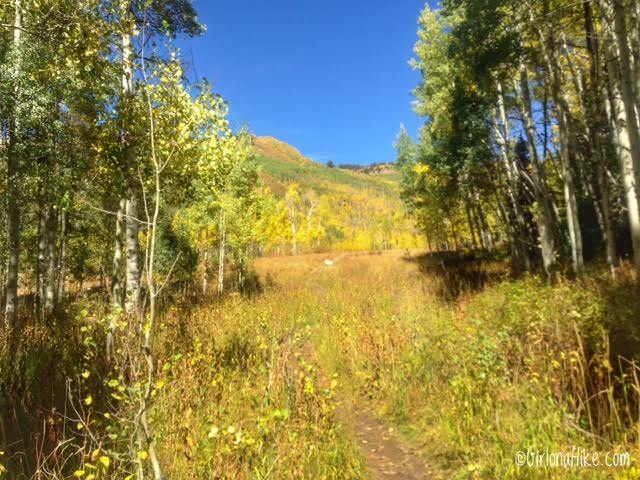 What a pretty easy little hike for when you don't have a lot of time. Love seeing the fall colors there!